End of Year Roller Skating Party. 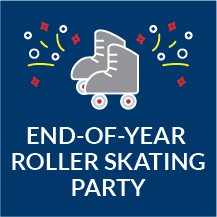 Families are invited to enjoy a fun night celebrating the end of the school year at Lombard Roller Rink, 201 22nd St, Lombard on Thursday, May 24 from 6 pm to 8 pm. Admission cost is free; skate rental is $4 per person and paid that night.